The Grasonville Volunteer Fire Department was first established in the summer of 1958. There were 36 original charter members in 1958. These thirty six men, together with nothing more than a desire to serve their community, founded one of the finest fire companies in Maryland. The thirty six charter members started with absolutely nothing more than a vision. Together, with the help of the County Commissioners, they purchased a fire engine from Civil Defense for $100. The members housed this engine in a garage behind the Grasonville Post Office. How did they respond to fires, one might ask? When there was an emergency, residents would telephone either Leonard Smith's Store or Holly's restaurant, where the members often gathered. In this modern era of Computer Aided Dispatch and Radio Pagers, anyone half way familiar with the fire service in days of old must shake there head in bewilderment, but it worked for them. The Grasonville Volunteer Fire Department has had a long tradition of being first. 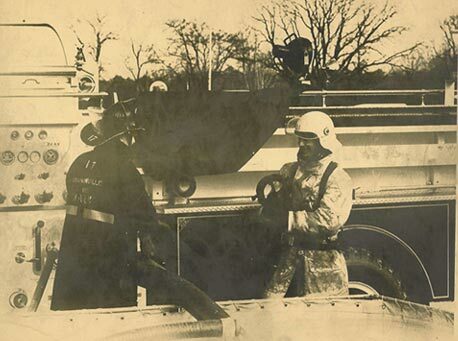 The Grasonville Volunteer Fire Department became the first Rescue company in Queen Anne's County and in 1971 the department became the very first department in Queen Anne's County to have a Hurst tool (Jaws-of-Life Rescue Tool). 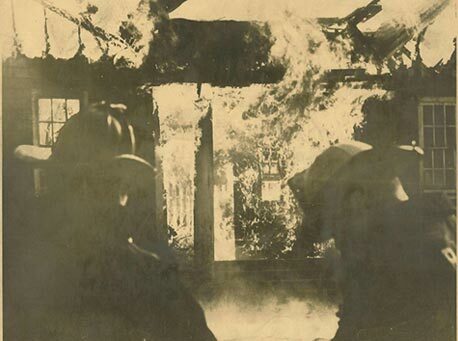 This standard of being first has been up held throughout the years as demonstrated in 1999 when the Grasonville Volunteer Fire Department became the first Department in Queen Anne's County to have a Thermal Imager. 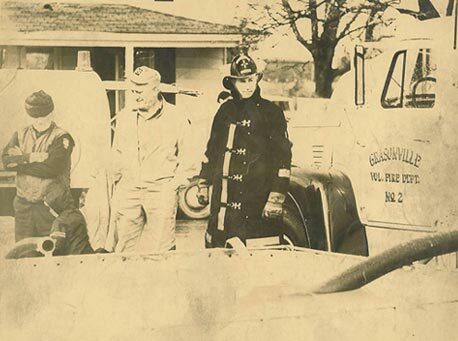 As our community grew so did the fire department, in 1960 Governor of Maryland G. Millard Tawes presided over the dedication of the Grasonville Volunteer Fire Department's Fire Station (Queen Anne's County Sta. 2). That Fire Station has remained relatively untouched for 45 years. When Oyster Cove was built, the Grasonville Vol. Fire Department underwent another massive change by adding a Truck company. 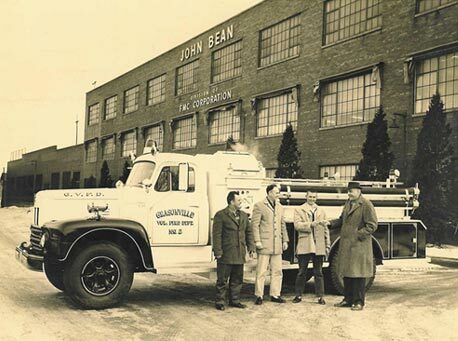 The first Ladder Truck was purchased in 1986 from Owings Mills and was a 1957 Ward-LaFrance. In 1992 the Department purchased Ladder 16 a Seagrave from Manhattan NY. In 1998 the Department purchased its first new and current Ladder Truck, a 1998 105' Pierce Quint (Ladder w/Pump). The Grasonville Volunteer Fire Department as it stands today has roughly 90 members, five major firefighting/rescue apparatus, a brush truck, a fire boat, and more importantly, the respect and admiration of the community we serve. The Grasonville Volunteer Fire Department has had only Six Fire Chiefs in 54 years, the 6th and current Chief Jason Anthony, Sr. is aware of where we have come from and looks forward to the future. He looks forward to the replacement of the Fire Station. The fire service has changed dramatically in only 54 years. Firefighters now are expected to handle hazardous materials calls, complicated rescue situations, and calls involving weapons of mass destruction. It is a very different fire department from the one that was founded in the summer of 1958, and the days of responding in a $100 fire engine from the back of the Grasonville Post Office. Our Fire Department has progressed to responding in half a million dollar fire apparatus to an ever changing community. The one thing that has always remained constant, is the same thing that the charter members had at the very first meeting in the Knights of Pythias Hall Lodge no. 115, the desire to serve their community. The current Department members are dedicated to remembering those who came before us and blazed the trail that we continue to follow, our Charter Members.